Patients who are morbidly obese are at elevated risk for hiatal hernia (HH), with up to 50% having HH that is asymptomatic. Some surgeons repair HH during bariatric surgery, although this practice is controversial and its success is dependent on a number of factors (for example, abdominal wall torque and increased visceral fat). Some experts contend that HH-related symptoms improve after weight-loss surgery, making repair of the hiatus unnecessary. Yet, simultaneous repair during bariatric surgery may be more efficient than undergoing separate procedures. A study published in the journal Surgery suggests repair of HH during bariatric surgery appears safe and feasible. This research team retrospectively enrolled 83 patients who had concomitant HH repair during bariatric surgery over a 4-year period (2010 to 2014). They examined baseline demographics, perioperative parameters, HH repair type, and postoperative outcomes. Eight of every 9 patients were women, and the average overall age was 57 years. Patients tended to be morbidly obese, with the average body mass index being 44.5 kg/m2. 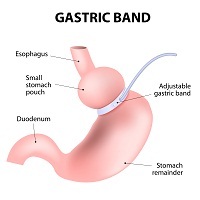 Most patients (n=61) underwent laparoscopic Roux-en-Y gastric bypass, with remaining patients undergoing laparoscopic sleeve gastrectomy. The surgeons identified HH before bariatric surgery in 32 (39%) study participants. The identified the majority of HH (n=51 or 61%) intraoperatively. Twenty-four patients developed early minor postoperative symptoms. At 1 year, patients had lost a considerable amount of weight; average BMI improved to 30 mg/kg2. Before surgery, 84% of patients were routinely taking anti-reflux medication. After surgery, approximately half were. Three patients developed late postoperative complications. When compared to matched controls, this group of patients had similar operative time, lengths of hospital stay (3.5 days), intraoperative complications, surgery-related symptoms, and weight-loss outcomes. One study limitation is that the researchers did not measure the hernia size.